We recently published a piece about the Museo Comunitario del Valle de Xico on our Recentering Periphery blog. You can find the interview we carried out with the community museum’s director, Genaro Amaro, here. We are saddened to hear that this amazing grassroots cultural initiative has been closed and is under threat of eviction from the Municipality of Chalco. Find in the following the museum’s public statement in Spanish. English translation below (thanks to Anna Provan for her contribution). 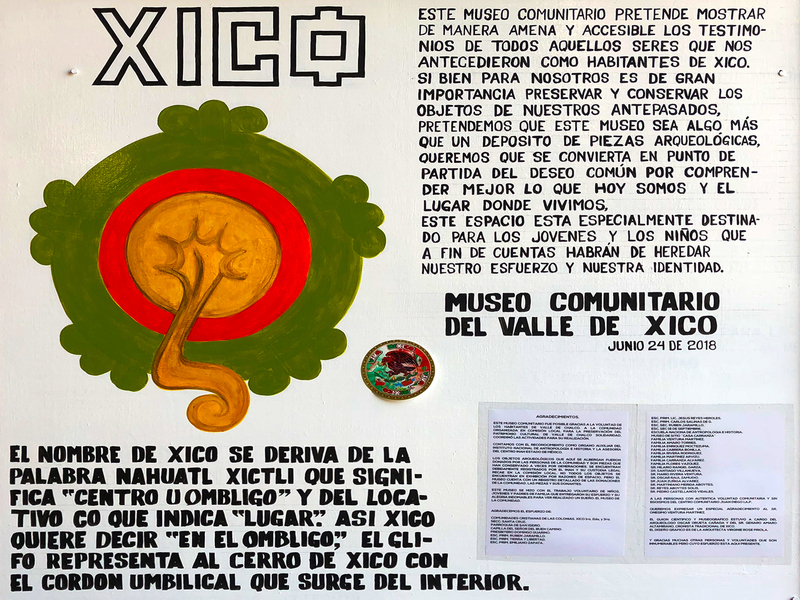 It is of vital importance to note that the Museo Comunitario del Valle de Xico is not municipal property, it is the property of the community. Its collection is made up of pieces donated by the community and it has functioned based on the work of community volunteers for more than 23 years. The pieces are duly registered to the National Institute of Anthropology and History (INAH). In addition, it is essential to point out that it is not “personal whim”, to evoke the language employed by the Constitutional President of Valle de Calco Solidaridad, C. Francisco Fernando Tenorio Contreras, during the interview he gave on the subject, that the museum is located in what was the treasury of Xico. Although it is true that the building is municipal property, the authorization for the museum to remain in that space was provided by the government itself, by means of a loan agreement. Finally, we point out that considering the museum does not belong to the municipal government, the appointment of its staff or director is not the government’s decision. Based on these elements, we denounce that yesterday, February 11th 2019 at around 10:30 am, Miguel Reséndiz Jiménez, who publically presents himself as a municipal journalist, even though formally he does not hold this position, appeared, without any official identification, along with several members of public security in the community museum facilities of Valle de Xico. Reséndiz said that by virtue of direct orders from the municipal president, we had to vacate the premises. As the due protocol merits, we asked to see the documents that supported his request. He responded that that was not necessary because they were direct orders from the president and the construction company had not yet delivered the relevant papers. We insisted that we must be presented with the proper documentation before evacuating the building. Without seeing such documents, we would close the museum with the sole intention of protecting the pieces and remove only the following objects: the visitor’s book, the volunteers’ cash register, a tablecloth and a planner with important events. By no means did we intend to remove archaeological objects in the public manner suggested by Tenorio Contreras. There were only three of our staff members in the museum. Miguel Reséndiz used force to kick one of them, while trying to close the door to prevent the other two from leaving. When we tried to help our colleague, Reséndiz called the police and left the site. Minutes later more members of security arrived at the facilities of the “hacienda” and closed the main access door. It wasn’t until this moment that they presented us with the papers and modified the reasons behind the eviction. They informed us that our eviction was due to the fact that we put the safety of children who attended a cultural event held at the museum on Saturday the 9th of February at risk, because there was a fallen tree. However, the event was cancelled and the reasons were made clear to the public in an appropriate and timely manner by the organisers. It is evident that this was repression and a direct attack towards our museum on the part of personnel of the city council and the Municipal President Francisco Fernando Tenorio Contreras, whom we have repeatedly sought to engage in dialogue and has always declined (we have the documentary evidence to show it). As a result of the incident and the videos we circulated that show the events of that day, the president announced his own version of events, which, by the way, present multiple inconsistencies. The first, that the museum is municipal property. As we said, the museum is the property of the community of Valle de Xico. Secondly, at the moment of eviction, Genaro Amaro Altamirano was not in the property. He was not therefore, as the authorities suggest, the one who tried to remove the green bag so that he could remove “some objects”. The bag was carried out by our colleague who was attacked by Miguel and she showed the contents of the bag in front of the cameras. Finally, that members of public security claim there was violence carried out against them. We have publically shown evidence of the violent acts carried out that day. If the authorities have their own to share, we encourage them to present it. There is no doubt that our museum will always fight for what is right, for our right to education, for our historic past, for our population, for our right to culture. Nowadays, these are rights they want to deny us. They will not succeed.